As the industry braces for the one-two punch of D23 and next weekend’s San Diego Comic-Con, comic book fans (and indeed moviegoers in general) can look forward to an avalanche of trailers, teasers, announcements, and casting news over the next fortnight or so. It all begins today at the Anaheim Convention Center, where the Mouse House has erected giant statues and floor-to-ceiling banners for some of 2018’s biggest movies – Ant-Man and the Wasp included. But if there’s one Marvel movie that’s making its presence felt, it’s Avengers: Infinity War. Joe and Anthony Russo’s star-studded blockbuster is said to be the culmination of all of the events that have defined and shaped the Marvel Cinematic Universe hitherto, and thanks to multiple post-credits scenes, we know that Earth’s Mightiest Heroes will be waging war against the Mad Titan himself, Thanos. Deadpool 2 actor Josh Brolin is attached to play the cosmic deity, who descends upon Earth in search of those precious Infinity Stones. But aside from CG stingers and Infinity War concept art, we’ve yet to see Thanos in all his glory. That all changes today thanks to the folks at DailySuperHero, who relayed this particularly striking shot of the Mad Titan straight from the show floor. 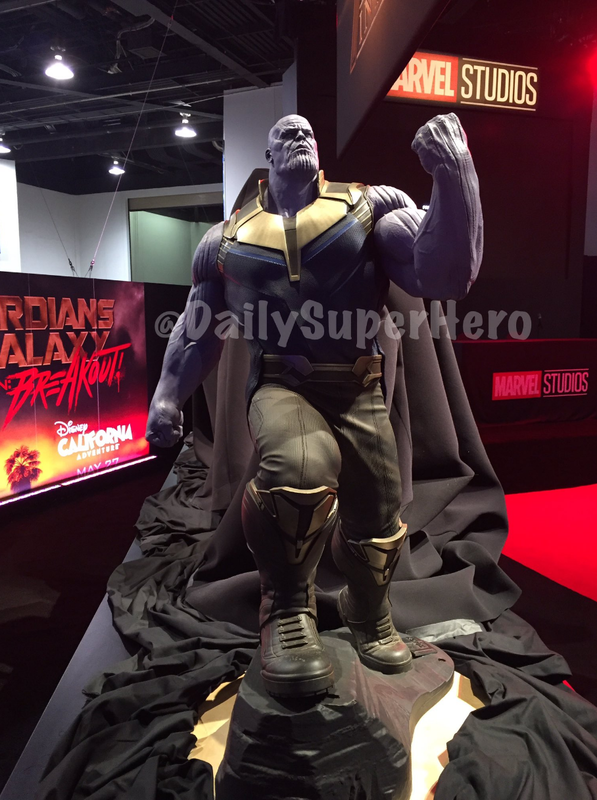 No sign of that iconic Infinity Gauntlet just yet, but this incredibly detailed statue showcases the purple-skinned baddie like we’ve never seen him before. Dressed down in pants and a gold-plated vest, Josh Brolin’s otherworldly nemesis certainly looks the part, and will no doubt cause all sorts of headaches for the Avengers when the lights go down on May 4th. And at least according to Thor: Ragnarok‘s Mark Ruffalo, those attending SDCC will have their minds blown by Marvel’s showcase – just don’t hold your breath for Infinity War‘s first teaser trailer, after head honcho Kevin Feige conceded that it’s more likely to arrive alongside Ragnarok in November. Avengers: Infinity War zooms into theaters on May 4th, 2018.